All it took was a drive down to the Bay Area, and Mother Nature decided to change her tune! And I thought washing my car and giving away a few winter coats would cause the clouds to appear. I'll have to leave Tahoe more often. It's looking like a foot of snow by Wednesday night. And if you can't remember what powder skiing looks like, check out this video created by Nat Fay. He and I had helmet cams mounted on Feb 15th, which was the last day with significant fresh snow at Northstar. It includes some good wipeouts and a few attempts to get some air. In case you're curious, I'm wearing the blue coat with a horizontal white stripe mid-back, and my skis are red. Yes, I do wipe out in a pretty comical way, but at least it wasn't in uniform! Northstar California Powder Day 15th Feb 2012 from Nathaniel Fay on Vimeo. Video shot at Northstar California, Lake Tahoe, California, USA. Skiers are: Liane Fang, Jay Palace & Nat Fay. Nat Fay was the principal editor of the video and the footage was shot with Jay's Go Pro and Nat's Contour Plus helmet cams. Here's a viral image going around Facebook which shows what people think our lives are like and what they're really like. I absolutely love it! But, what I really do is have a ton of fun whether I'm teaching kids or adults. If you want to find out what it's like, one way would be to take a lesson, even if you're already quite good. We have a lesson called a "Rise & Shine" because it runs from the moment the lifts open at 8:30 to 9:30. 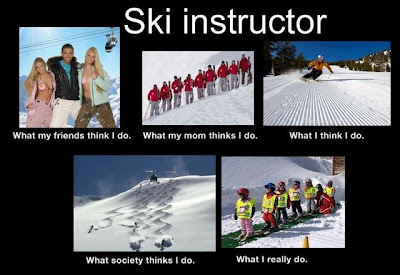 These lessons are great for upper level skiers who want to have their skiing assessed and get one or two things to work on to improve their skiing. For a video taste, check out these two video clips of Bob Andres, a Rise and Shine client from earlier this week. As I often do, I shot video during the lesson, and I'm sharing it here with Bob's permission so that he can see what he was working on, and show off how he's been ripping up our great groomers at Northstar this week. First... because everyone keeps asking.... Yes! We have tons of great snow at Northstar. It's not last year, but it's better than any skiing I did as a kid in Vermont and New Hampshire. And... the forecast is calling for 6-12 inches by end of day on Monday. And... my GoPro has been getting a work-out during all the lessons we've got going on. Thankfully, my friend and former NS Instructor, Nat Fay, is visiting from Australia, where he teaches video editing. PS - "A" did all of her own stunts, and most of them in only one take. PPS - No children were hurt during the making of this video. A few weeks ago, we were worried the ski season would be a total loss, with no natural snow on the horizon and temperatures hovering too high for Northstar's snowmakers. But after one small but special skier returned to Northstar after we thought we'd lost her to Squaw, things started looking up... check out this trailer for the movie documenting the miracle!